Water Iris or Swamp Iris, for proper care Louisiana Iris requires a damp and slightly acidic soil. 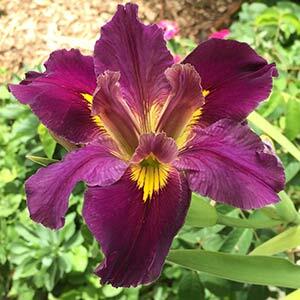 Louisiana Iris ‘Ann Chowning’ is one of the best known cultivars along with ‘sinfonietta’ and ‘colorific’. 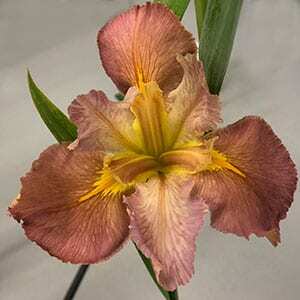 This is an iris grow well in all states, and are also one of the few Iris to do well in warm humid conditions, so if you live in the sub tropics and you have a pond, Louisiana Iris are probably the ones for you. The variety in colors of these spectacular plants available for sale is enormous. Louisiana Iris are a hardy perennial with evergreen sword-like green foliage, native to America producing beautiful flowers, the Louisiana Iris is one of the hardiest iris available and actually fairly easy to care for. They prefer sun to partial shade and grow well in moist soil. Available in many shades, dark red, purple, yellow, pink and white. A huge selection are available from the nurseries listed below. Ideal conditions for Louisiana Iris are in a pot 2/3 immersed in a pond. Time to plant is in summer when they are dormant. The best time to fertilise Louisiana Iris is in winter to very early spring, just before flowering. A low nitrogen fertiliser is best as high nitrogen fertiliser tend to encourage foliage growth and inhibit flowering. These are an Iris that need to be divided regularly, it is the new offsets that flower each year, so they need room to grow, When dividing the established clump you will see older rhizomes with new ones attached. The new rhizomes will have green foliage emerging from the tips. Any rhizome that does not show signs of growth can be cut away and disposed of. Keep the rhizomes moist while you are getting ready to replant. Before replanting, dig of the area to be planted adding compost and cow manure. Plant rhizomes at around 30cm (12 inches) apart in groups of 3. This will give them enough room to grow for another few years. Make sure the foliage fan is facing upward and in the right position for viewing. Plant the rhizome covering the roots well. Water in and cover with mulch.